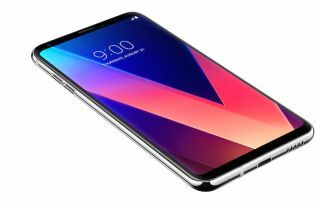 LG V30 is first phone with MQA audio and OLED 'FullVision' display | What Hi-Fi? We recently announced that LG’s sound quality-focused flagship was the “the first global smartphone to support MQA,” and now we know that it’s a phone of many more firsts. LG claims the V30 is the first phone with an F1.6 aperture camera lens, the first with a glass Crystal Clear Lens and the first with an OLED FullVision display. Marketing or meaningful firsts? We'll have to wait and see. To first reiterate the audio side of things, the V30's MQA support means that users will be able to store hi-res audio files more easily and conveniently. This move builds on the LG V30’s predecessor, the V20, which introduced a Hi-Fi Quad DAC in a bid to be sonically superior to its rivals. The V30 features an “advanced” version of that DAC. The LG V30 has a 32-bit Advanced Hi-Fi Quad DAC, powered by ESS Technology’s SABRE ES9218P, and has been tuned by B&O PLAY’s sound engineers. The V30 has a 6in QHD+ (2880 x 1440) OLED FullVision display. Weighing 158g and 7.3mm thick, the smartphone is, according to LG, also “the lightest among smartphones in the 6-inch and over category.” It’s water and dust resistant to the IP68 standard, too, so can supposedly be immersed in up to 1.5 meters of water for as long as 30 minutes. The V30’s dual camera features a F1.6 aperture camera and glass lens, while the second camera is an upgraded 13mp wide angle lens with “two-thirds less edge distortion” than on the V20. MORE: MQA audio: what is it? How can you get it? The Qualcomm Snapdragon 835 processor supports Daydream – Google’s VR platform – while the Google Assistant on board includes unique phone-specific capabilities. For example, saying “Ok Google, take a romantic Cine Video” kickstarts the phone’s new video shooting mode. Select LG appliances including a washing machine, refrigerator and robot vacuum are also compatible with the Google Assistant when using the V30. Face recognition now joins voice recognition and the fingerprint sensor as methods to unlock the screen, too, and thanks to Quick Charge 3.0, the V30 can charge from empty to 50% in around 30 minutes. The V30 has 64GB of storage onboard, while the LG V30+ – available in “limited markets” – pushes that to 128GB. A microSD card can expand that by up to 2TB, too – plenty of room for those hi-res MQA albums, then. The LG V30, which comes in black, silver, blue and violet, will first be available in South Korea from 21st September, with the rest of the world due to follow soon after... We hope.